Featuring unparalleled elegance and charm, Oasis Villa 2 is the perfect haven for anyone seeking escapism from the hustle and bustle of everyday life. 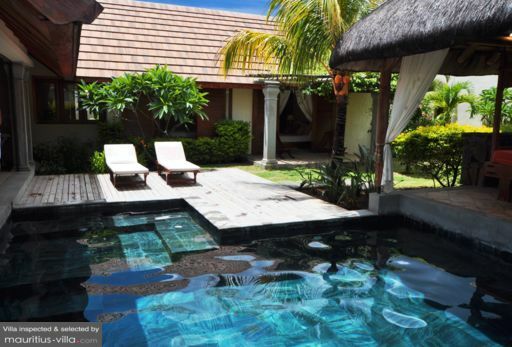 Indeed, this villa has been lovingly set up to accommodate couples or families who want to enjoy their own space and independence after a full day of exploring the island of Mauritius. Self-catering and offering a wide range of services to ensure your comfort, Oasis Villa 2 radiates luxury and tranquility. Oasis Villa 2 includes a Master Bedroom with a King-sized bed, comfortable mattress and an air-conditioning system: the perfect formula for a good night’s sleep as you recharge your batteries. In the Master Bedroom, you will also find a safe to keep your valuables locked up over the holidays. A dressing area is included as well. This bedroom contains an en-suite Master bathroom where you can soak in the sunk-in marble tub for long, luxurious hours. A shower, sink, toilet and mirrors have also been installed. The Master Bedroom overlooks the garden and swimming pool. With a maximum room capacity of 5 people, Oasis Villa 2 is also equipped with a second guest bedroom that comes with one double bed. Like the master bedroom, this one does come with its own en-suite bathroom with marble tub, shower, sink, toilet and mirrors. It is air-conditioned and comes with a dresser. Oasis Villa 2 is especially reputed for its massive emerald-green garden enhanced by tropical flowers and plants. Designed to inspire a glorious sense of calm and peacefulness, this garden also houses a massive private swimming pool of 5.4m x 6.3m, providing you with ample opportunities to cool off after a fruitful day of exploring the island. 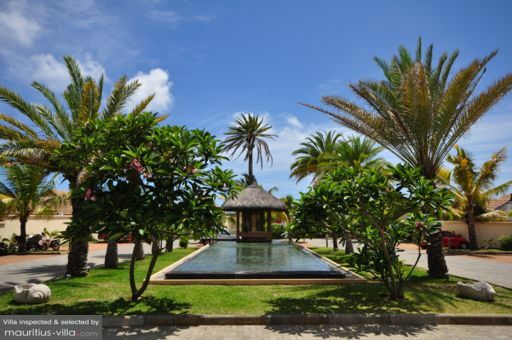 Scattered around the garden are sun loungers, where you will be able to relax and soak in the delectably warm rays of the world-famous Mauritian sun. Enjoy some Al-Fresco dining with your loved ones as you make the most out of the BBQ equipment that have already been set up in the garden. In fact, the villa also comes with a furnished gazebo where you can enjoy your meals or simply put your legs up and relax as you watch the sun sink behind the abundant greenery. At Oasis Villa 2, guests will be able to enjoy a spacious living area where time loses all meaning. From the large living room, with sofa and a flat-screen television to the fully-furnished dining room, you can be sure that you’ll benefit from a homely and highly comfortable feeling. The kitchen is fully equipped with all the appliances and utensils you might need to prepare your meals. The living area has also been fitted with a ceiling fan to help ward off some of the heat during summer. At Oasis Villa 2, there’s no denying that guests will enjoy royalty treatment for the entire duration of their stay. The complex features 24/7 security and concierge services which remains at your disposal to help you with anything you might need. Best of all, you can forget about tedious housework during your stay since the villa also offers a daily maid service to take care of the cleaning. A continental breakfast is also offered every morning and this comprises of a hamper full of delicacies such as assorted pastries, fresh fruit juice, jam, butter as well as tea and coffee and the likes. If you’re in the mood for something more indulgent, you can opt for supplements such as eggs and sausages which the maid can cook for you. In fact, another supplement that Oasis Villa 2 offers is the services of a reputed and highly-skilled In-House Chef to take care of your meals while you make the most out of your holidays. Other A La Carte services include grocery delivery, various types of excursions around the island, baby-sitting, car rental and the likes (all at an extra cost). Guests at Oasis Villa 2 are also given exclusive access to a private beach known as La Plage. No vacation is complete without some much-deserved pampering. Which is exactly why you should make the most out of 5 Sens Spa which is found a mere ten minutes away from the villa. This spa is located in the Domaine des Alizees complex, which also contains a gourmet restaurant known as Archipel des Saveurs. If you want to make the most out of the island’s urban lifestyle, head over to Grand Baie, Mauritius’ most entertaining tourist hub. Bursting with nightclubs, casinos and restaurant, Grand Baie also houses some of the island’s most scenic beaches such as La Cuvette.